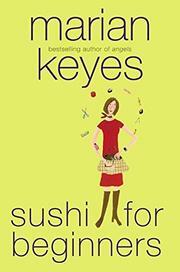 Keyes, with a number of wry, funny novels about wry, funny women under her designer belt (Angels, 2002, etc. ), falters in her sixth: a concoction with the usual ingredients but without the usual magic. Having reached the top as editor of London’s glossiest fashion mag (not without the requisite bitchiness and backstabbing), Lisa Edwards is betting that the boys upstairs have summoned her to offer an even better position with their New York magazine. Instead, Lisa’s being shipped off to Dublin (for fashion it might as well be Dubai) to start up the new magazine Colleen. Sharing office space with Gaelic Knitting and Hibernian Bride, Lisa also finds a small and unfashionable staff. Ashling Kennedy is her editorial assistant and the perennial good girl. Dubbed “Miss Fix-it” by yummy corporate head Jack Devine, Ashling is superstitious, mildly neurotic, and a bit ordinary, but in the most likable way. Then there’s Ashling’s best friend, the beautiful Clodagh, who, with kind husband Dylan, two gorgeous little ones, a grand house in the city should be happy—but (naturally) she’s not, and longs for a moment of peace and quiet. Or a night out on the town. Or something that doesn’t involve the husband or kids. The three women forge ahead at various speeds: determined Lisa, stick-thin and already wearing next year’s fashion, has set her teeth on Jack Devine. Ashling, despite her insecurities, has come up with great ideas for the magazine and is dating a rising comedian, and Clodagh decides she wants to try for a job. But things for all three begin to fall apart, and each contemplates a nervous breakdown. It’s only Ashling, though, who’ll fail to rally at her bad news. This Irish author’s standard mix of armchair psychology and hip female fun is a bit forced here, and the three-way split for the narrative works less well than investing in only one gal might have. Still, Keyes’s chic-lit (even this) is miles above the norm.